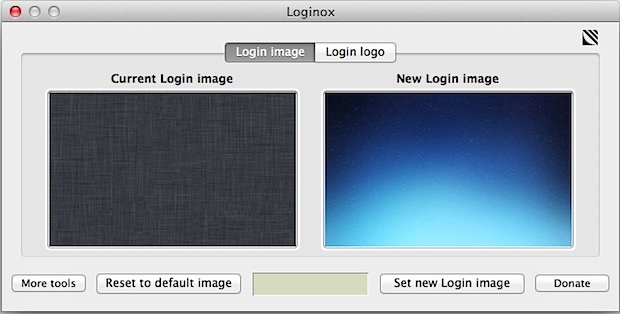 We recently showed you how to manually change the login screen wallpaper, but if you don’t want to deal with resizing images and digging around in the filesystem, you can use a free app called Loginox. Loginox sets new background wallpaper at the click of a button, resizing the images for you to the native screen resolution. The tool can also customize the login screens logo from the default Apple to anything else, although smaller transparent PNG’s look best. If at any point you decide you don’t like your changes, just clicking the “Reset to default image” button in either tab will restore the default background linen and Apple logo. It’s a no frills app, but gets the job done easily, and it’s free. We’re focusing on OS X 10.7 Lion, but Loginox works with Mac OS X 10.5 and 10.6 too, so if you haven’t upgraded yet you can still use the app to customize your login screen. Love this stuff, I am the love of it. It gives you a few more options to change. I still can’t believe that these customizations/settings are not part of the OS and accessible via the System Preferences. Be careful because changing this image can make going into a full screen app lag annoyingly bad. You can use too LoginSwitcher, Free and work from 10.4 to 10.7. Resize, convert, repair Autorisations auto. What is that wallpaper in the right box? :O it’s beautiful! Loginox is great. Thank you. Is there a way to expand the text field on the login screen? I am referring to the text field that appears below the user name and password field if you’ve placed text in the “Set Lock Message…” field of the Security & Privacy system preference. This field seems to be limited to about 200 characters and I need to expand it to 500 characters. damn! my macbook is lag after change it!